I love instagram, full of beautiful imagery and quotes (along with a few silly ones). My account is choc-a-block with my latest flowery images and ideas, so go ahead and follow me! If you haven’t already registered with instagram yet, you can do so here, I promise you won’t regret it! 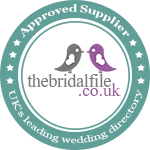 We are now an approved supplier on The Bridal File, check it out for details of other local suppliers you may need for your wedding planning. I have finally gotten around to changing my flower van graphics, what do you all think? I love the modern, neat look with my updated logo, mint is also my new fave colour! too soon to talk about your christmas party decorations?